Map showing location of Total discovery on West of Shetlands Block 206/4a. Drillinginfo. 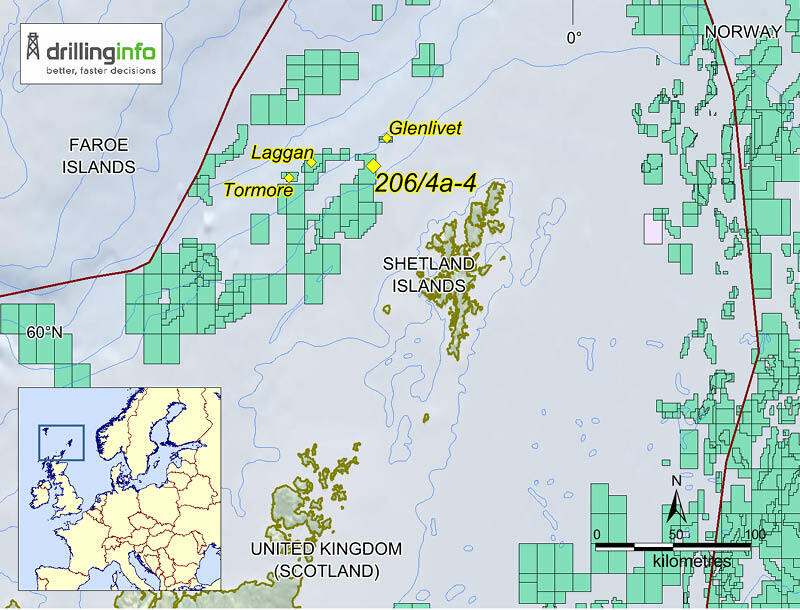 Total has discovered an estimated 1 Tcfg recoverable resources with a NFW on West of Shetlands Block 206/4a, encountering 42m net pay in a high quality Early Cretaceous reservoir. The well was spudded on 27 May 2018 from a location on the nearby Edradour field. It reached TD at 4,312m MD in August and Total announced the result in late September following logging and preliminary testing. The field is named Glendronach after a Scottish whisky, as are the nearby Laggan, Tormore, Glenlivet and Edradour discoveries. It is the largest conventional gas field found in the UK since 2008. Block 206/4a is in Total’s P1453 licence, which is shared with INEOS E&P UK (20%) and SSE E&P UK (20%). The block lies about 50 km north-west of the Shetlands and covers more than 200 km2. The acreage contains the Edradour gas field, discovered in Cretaceous Albian turbidites in 2010. The Edradour and Glenlivet fields have been developed through a tie-in to Laggan and Tormore infrastructure and came onstream in August 2017. Combined, these fields have 65 MMboe estimated reserves and will produce up to 56,000 boepd. Borneo, the world’s third largest island, has lush tropical forests, rich wildlife, coral reefs, and fascinating tribal cultures. It also has classical petroleum basins characterized by vast deltaic sediments and carbonate platforms which continue to make this region an attractive source of energy for the populous Asian markets.